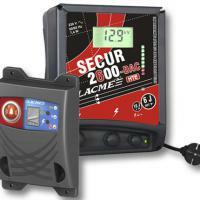 It is possible to install from 1 to 4 responders on fences in order to keep the SECUR 2006 or SECUR 2006 ALT informed on the quality of the received impulse. Self-fed by fence’s impulses they do not need batteries or 230 V net connection. Installed on poles or line end, thanks to a configuration suitable to the fence, they can register incidents as something or somebody passing through the open barrier or a cut wire or deterioration in the round.